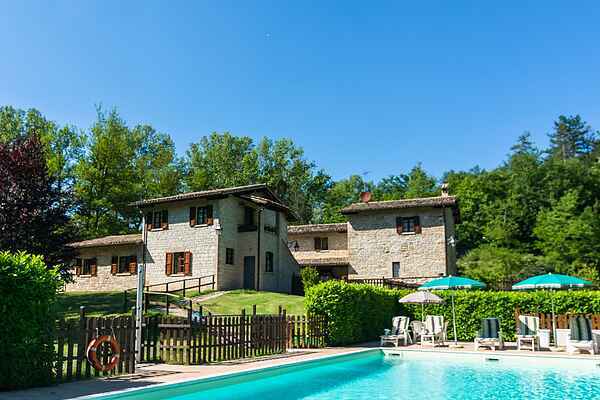 Talassa apartment is located on a beautiful estate in the hills near Gubbio. The estate has a beautiful location in the Umbria region near Tuscany and Marche. It is an oasis of calm in nature, ideal for a relaxing holiday. On the estate are two rustic houses with a total of five apartments. It was once an antique mill and the owner has completely restored preserving its original architecture. The apartments feature exposed beams and terracotta tiles. The decor is rustic and the atmosphere is friendly and cozy. Each apartment has a private terrace with garden furniture. There is a spacious garden with a swimming pool and a Jacuzzi. It is a wonderful place for children because of the large garden and swimming pool where they can play. The estate is an ideal starting point to visit the cities of Todi, Perugia, Assisi, Orvieto, Spoleto. Nature, art, history and gastronomy can be found here. You can make beautiful trips to the National Park of the Sibillini Mountains with peaks over 2,000 meters and to the Regional Park of Monte Cucco.